Vesta, a clear favorite neighborhood gem of mine has gained many new converts over the past year. It's easy to see why, with their infectious warmth and hospitality, a cozy setting that lets you relax and the focal point - delectable, locally-sourced, organic food. goat's cheese. I loved the contrast in textures and dipping one of these beauties into the crushed tomato & toasted garlic chutney made it even better. One suggestion given to me by a fellow dining companion, Arthur Schwartz (yes, the Arthur Schwartz aka The Food Maven and author of Jewish Home Cooking), was to bring out the flavor in the blossoms more by maybe making the crust thinner. 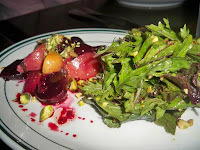 Baby Beet Salad - Beets are one of my favorite vegetables, to the point where I'm a bit obsessed with them. I had a beet salad for lunch earlier that day but seeing this vegetable at the dinner table, made me very happy. I loved the contrast in colors - there were red and yellow beets, which had a hint of sweetness. Dressed with buttery pistachios, it was a great way to start the meal. The "salad" part consisted of slightly bitter mustard greens, bringing the senses to attention. Roasted Duck Breast - Usually picky about my duck meat (it could be fatty and gamey), this was anything but. Glazed with a hot pepper agrodolce, it brought both sweetness and tartness to the tastebuds. I loved the way it was cooked - medium-rare and the cut was nice and lean. Braised Veal Cheeks and Crispy Sweetbreads - A new dish for me on both counts, I was eager to try it. The veal was so tender that it fell apart in perfect little sections. 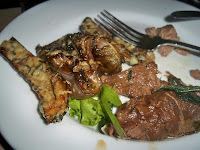 I liked alternating my bites between the meat and the thickly coated, crunchy sweetbreads, which were just slightly chewy and moist inside. Veggie Sides - The veal and sweetbreads were coupled with fresh, seasonal vegetables including earthy green and purple kale, interlaced with heirloom cherry tomatoes. I loved the combination, as the tomatoes provided a burst of sweetness - a good contrast with the bitter kale. 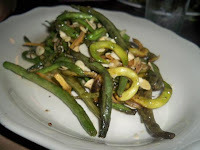 Another side was the charred green, yellow and even purple string beans, seasoned with lemons and almonds. I've never seen this amount of color on beans and was fascinated. They were not only crunchy and flavorful, they were light enough to make you reach for seconds. My favorite side was the roasted eggplant, topped with Ouray cheese and basil. Although the dish was simple, the eggplant was roasted to perfection with a slightly crispy outside and a soft, chewy inside. The cheese was a great pairing, with its buttery, tangy bite - it made an ordinary vegetable feel more substantial. Ricotta Gelato - Because I've tasted Vesta's fluffy-as-clouds ricotta cheese, I knew that the gelato would be a winner. The consistency was perfect - soft enough to divide easily with a spoon. It was creamy yet not overly rich that you needed to chase it with a beverage. 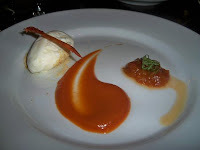 There was a tomato puree on the side that really made it sing - it was sweet, a bit acidy, and when combined with the gentle ricotta gelato, it produced a refreshing finish to the meal. Bundt Cakes - We each received individually wrapped bundt cakes, courtesy of Bundt A Bakery, as favors. I liked the concept of the bundt, a throwback to old fashioned, comfort baking. Taking a bite out of Arthur's, I loved its airy dough, which was flavored by fragrant spices - cinnamon, cloves and honey too! The dinner was a big success from many perspectives - Vesta got to show off their wonderful, farm supplier, we had the chance to sample and learn about new foods and most of all, everyone just had a good ol' time. To put it in layman terms, if you haven't been to Vesta yet, you're missing out!